Disclosure: I received a swimsuit for review from Hapari. All opinions are my own. 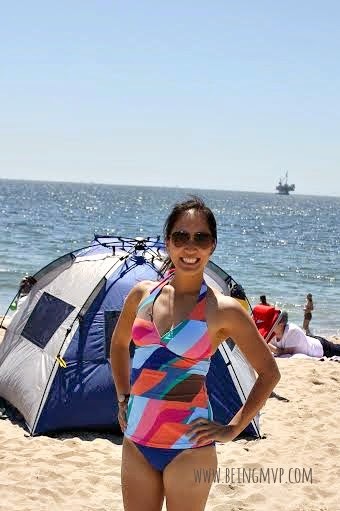 I can't believe how quickly this year is passing by and it's time to hit the beach again here in Southern California. Since I have not lost all the baby weight from Mason (still! ), I am not quite confident to rock the bikini but still want to look fashionable and hot so I found some cute styles at Hapari. Hapari believes that every woman should look and feel beautiful while being comfortable and confident in quality swimwear. No matter what your body type or size, you can find something that will be flattering to your figure at Hapari. I've never worn a Tankini so I was pleasantly surprised at how fun and flattering this style was for my body. The Sunstripe V-Neck Tankini Top ($49) paired with the Dream Blue Cali Bikini Bottom ($29) is fun and bold for this summer. The neckline is flattering for even my small bust and the longer length of the tankini works great for my long torso. You can also wear the straps three ways - halter, criss-cross or tank. I am used to the halter style which I think is flattering on me. This top isn't too clingy so my slight muffin stays concealed. The loop detail on the Cali bottoms is nice and while I usually wear tie bottoms, this feels more secure when I'm chasing after the kids. Both pieces are made of 80% nylon and 20% spandex with UPF 50+ (awesome sun protection). Hapari swimwear is easily machine washable or by hand. It is recommended to line dry to preserve the life of the suit. There are many styles and prints to choose from and if you need help deciding, contact the Hapari Style Consultants at (866) 525-SWIM (7946). You'll get free, expert advice on how our different sizes, styles and fits can help flatter your figure. Make sure to connect with Hapari on Facebook and Twitter! I really like the Capri and White Classic Bandeau Tankini, with the white skirt!! Okay,first of all,you look AMAZING! Second,I hate shopping for swimsuits.It's like they make the lighting in the dressing rooms as harsh as possible so you look awful no matter what.I keep seeing great reviews about Hapari and win or not I can't wait to get my suit from them! I would get the red boy short bottoms and the black tie front string bikini top. It is always so hard shopping for a suit that looks good on me. These are really cute suits though. I think I'd like the Red Twist Bikini Top with the Red Hibiscus Drawstring Swim Skirt with Bottom. I would get the Sunstripe Sport Tankini Top, and the Dream Blue regular bikini bottoms! I hate shopping for swim suits, it seems almost impossible to find one in the right size and a print that I actually really like! I really like the Denim Tile Sport Tankini. I don't love shopping for bathing suits, but Hapari has a great tankini selection. I love the Black Plus Size Sport Tankini Top. I like the Zebra V-Neck Tankini Top with the boyshort bottoms. I like the red diamond dot twist tankini top. I think I would get the Sunstripe Seaside Tankini and Swimdress with the Dream Blue Tummy Tuk Swim Shorts. I hate shopping for swim suits because I can never find anything that fits good and looks good! I would get the MIKADO HIBISCUS SPORT TANKINI TOP! The last time I got a suit it was from hapari so i have to say my experience has been great! I love the Sunstripe V-Neck Tankini. I haven't had to bad of an experience shopping for bathing suits as long as they are tankinis!! I love the sunstripe bikini top and bottoms! It's hard to find the top and a bottom that coordinate and are in my size and that I like when I go to store. I love the hapari red hyacinth bikini top. Love the Red Hibiscus Twist Bikini Top! I would like the BLACK CLASSIC BANDEAU TANKINI TOP. I dont' like shopping for swimwear in stores, but online has been fine. I like the Sunstripe Eyelet String Tankini Top. It's hard to find a suit to cover you properly, but also look young and not frumpy. I would choose the Leilani v-neck tankini and the black boy shorts. It's so hard to find a nice swimsuit these days! I wish it were easier to shop for them! I like the Pink Desert Wave V-Neck Tankini Top and matching swim shorts for my daughter. I don't wear swimwear anymore since I am too big and prefer shorts and a tee but they have some lovely plus sized swimwear so I might re-think that in the future. I have a hard time finding something my daughter likes but they have swim skirts and shorts which are perfect for her since she hates the traditional bottoms. Out of all the suits I love the one you have on the best! I have the worst time finding a suit. Like every woman, I have body issues and it's hard to find a suit that flatters every part of you. I generally stick more to the tankinis and cute little skirts. Id love the Sunstripe print you chose in a v-neck one piece. I need some suits that are more conservative but still young and fun! Swimwuit shopping has gotten better for me now that most places allow you to order different top and bottom sizes. I always have issue when shopping for a suit. I like the purple Belize vneck tankini top. I would get the RED HIBISCUS SPORT TANKINI TOP with the black boy shorts. I really never find the suit that I like shopping offline so it's online for me and these are great! I like the dream blue tummy tuk shorts and pretty much any sport tankini that would match. It's going to be hard to choose. It's nice to find a company that makes it easier to shop for swimwear! It's something we all hate! I'd really love the White Desert Wave Tankini Top and the Dream Blue Drawstring Skirt Bottoms.... I always have a hard time finding swimwear that is modest enough but also easy to breastfeed in! The design of the sport tankini top would allow me to do that! I would get the Zebra V-Neck Tankini top with brown boy shorts. I love the Black Scoop One-Piece - I have a hard time finding things that hide my belly- so a one piece is the way to go for me most of the time, but they are not always flattering! I love the Denim Dancing Leaves Tankini top. I have had a hard time swim suit shopping. It is hard to find something cute that fits right, but also isn't super revealing. And for a good price! I like the sunstripe eyelet string tankini top. I am not a fan of swimsuit shopping so generally try to just get it over and done with as quickly as possible and only buy a new swimsuit when my old one wears out. I find it can be hard to find a top and bottoms in a set where both pieces fit. I would love to get the black twist one piece. I can never find a swimsuit that I love. I like the Red Diamond Dot V-Neck Tankini Top. Swimsuit shopping is such a chore. It is a must since I live in FL, and spend tons of time at the beach. But every year I walk away with the feeling that I still haven't found the perfect suit. Well, one year I did. But another kid later and... it isn't perfect any more. i like the sunstripe bikini. I love the colors its so gorgeous. And ordering bikinis online is really tough because of the sizing. I'm not just a simple "small" or medium"
I would choose the Retro Fashion Plus Size Seaside Tankini And Sundress and a bottom to go with it. I am large in the chest so am hard to fit. this looks like it would work great for me. I like the "Black Sport Tankini Top" and the "Black Regular Bikini Bottom"
I like the Black Sport One-Piece Swimsuit. It's hard to find one that fits the way I want. I love the Blue Tribal Boys Compression Swim Short for my little guy! I hate shopping for bathing suits! I usually find one I love and its too short or to low cut! I like the Pink Desert Wave V-Neck Tankini. I like the White Desert Wave Plus Size Sport Tankini Top to be paired with tummy tuk swim shorts. I have had so much trouble finding a swim suit that is comfortable and fits me. I would truly love to try this brand for a great fit. Loving all the bright colors - especially the red diamond dot twist tankini top! I really love to try the tummy tuk bottoms! I have a hard time shopping for swimsuits because I'm so picky. I would like to get the Dream Blue Tie Front String Bikini Top. I like the Dream Blue SOS Underwire Tankini! I have trouble finding attractive swimsuits in small sizes that aren't bikinis or juniors. I like the Mikado Hibiscus Twist One Piece Swimsuit. I don't have a problem finding swimsuits. I like the Red Twist One Piece Swimsuit. I always dread trying on swimsuits!!!! I would get a tankini swimdress. I like the denim tile one and the one with flowers as well. Being that I am due soon with another baby, I really need a swimdress I can feel comfortable in with my new post-baby body. I always feel very self conscious in swimsuits and like modest cut suits and the tankini swim dresses cover these bases for me.